Oi, David, Doctor Who is way more than 40 years old now, you know! I’m telling him this because he has a habit, on the covers of these collections, of standing in front of the series title so that it resembles the 40th-anniversary logo from 2003. Look, he’s done it again! In The Taking of Chelsea 426, the Time Lord confronts not only the Sontarans but also their enemy the Rutan Host. The problem – or rather one of the problems – is that the aliens don’t behave as they normally do. The Sontarans that we encounter in this novel are part of an intelligence division rather than the usual battle fleet. Their job is to investigate reports of Rutan activity rather than to attack first and ask questions later. I can accept this – after all, we know from The Sontaran Experiment that this warrior race is quite capable of meticulous planning and detailed analysis when it is deemed necessary. However, David Llewellyn’s depiction of the Rutans is extremely peculiar. Rather than mimic other intelligent life forms, as they usually do, here the Rutans take the form of plant spores and possess any humans who are unfortunate enough to inhale them. This leads me to wonder whether the book started out as a story featuring Krynoids, Varga plants or some brand-new vegetable menace, but the author was asked to include the Rutans instead and therefore work in the Sontarans as well. Perhaps it’s for the best, as The Taking of Chelsea 426 needs all the audience hooks it can get. It isn’t the most gripping new series novel ever written, with little in the way of suspense or mystery, and neither side in the interplanetary conflict seems to have a particularly well thought out plan of action. It’s a pleasant enough listen, though, not demanding too much of your attention if you’re taking it in while driving or carrying out chores. Younger listeners should appreciate the fact that the Doctor’s temporary companions are a brother and sister in their early teens, which make a nice change from the usual young adult female. There’s also an eccentric war veteran hotel guest known simply as the Major, who is clearly inspired by the character with the same title in Fawlty Towers. 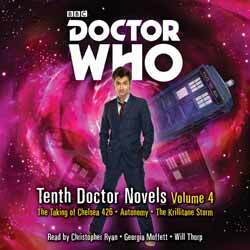 It helps that the story is well read by Christopher Ryan, who played Sontarans in The Sontaran Stratagem, The Poison Sky and The Pandorica Opens (this audio book was recorded before Dan Starkey became the go-to guy for Sontaran-related voice-overs, and much more audio work besides). Ryan’s narrating voice sounds surprisingly posh – a far cry from Mike in The Young Ones or Dave Hedgehog in Bottom. You may worry at first that his reading is too dry. However, he soon unleashes a diverse range of voices for the various characters, several of which, including the Major, are rather amusing. Both The Taking of Chelsea 426 and Autonomy take similar approaches to depicting the hospitality industry – larger than life, Doctor Who style. David Llewellyn gave us flying hotels in a futuristic new town. Now, Daniel Blythe presents us with a giant shopping mall. However, whereas the Sontaran story was set in the far future, this Auton tale takes place close to the present day. Following a brief prologue set in 2009, Autonomy jumps forward to 2013 (which was the future when the book was originally released). The narrative suggests that the UK would be using the Euro by this time, but as I listen to these CDs while the Brexit debate rumbles on, nothing could be further from the truth! Unlike the Sontarans and the Krillitanes, the Nestenes never battled David Tennant’s Doctor on TV, though they did help to launch the new series, back when Christopher Eccleston was the star of the show. This time they take on a range of new forms, as plastics have become ever-more versatile, including clothes and even fake snow – though the traditional shop-window dummies also feature heavily. The autonomy angle (see what the author did there?) had been done before, in licensed fiction such as Brave New Town, and would soon crop up again on screen, in the form of the Auton Rory, but Blythe puts a sufficiently original spin on his story. His embellishments, apart from the obvious consumerism slant, include allusions to celebrities associated with reality TV and other types of almost Auton-like ‘manufactured talent’. Big Brother is mentioned by name. Hyperville boss Sir Gerry Hobbes-Mayhew, like Lord Alan Sugar, is a plain-speaking business leader training up some apprentices. Like Posh and Becks or Cheryl and Ashley Cole (who split a year after the book was published), Shaneequi and Paul Kendrick are a married couple comprising a pop star and a football player. Georgia Moffett, who played Jenny in The Doctor’s Daughter, and later became Mrs Tennant, is an appropriate choice of reader, as there are a number of young female characters to be voiced, including a couple of schoolgirls who are our route into the story. Hearing Moffett speaking the Time Lord’s words really brings home the fact that the Thirteenth Doctor is basically the Tenth in female form. As in The Taking of Chelsea 426, the Doctor is aided by a pair of teenage siblings, the decidedly chavvy Chantelle and Reece Stanford – though he spends more time with a grown-up, the resourceful if rather bland Kate Maguire. Chantelle and Reece’s mother, Tricia, is not unlike Jackie Tyler, and ends up finding herself in some comparable situations. The introductions of some of these characters are a little clunky, and Blythe’s characterisation of the baddies’ underling Max Carson is uneven, but the story smooths out as it unfolds. Of the three novels in this volume, The Krillitane Storm was the one I was looking forward to the least when I read the original books. Compared to the Autons and the Sontarans, the Krillitanes weren’t such an exciting prospect for me. They’ve appeared in the TV show just once, in School Reunion, an episode in which the monsters of the week paled into insignificance compared to the return of Sarah Jane Smith and K9. Besides, aliens that can mimic humans are ten a penny in popular science fiction. As it turns out, though, The Krillitane Storm is actually my favourite book in this batch. Christopher Cooper makes interesting use of the creatures, whose reasons for being in 12th-century Worcester are shrouded in mystery. The author acknowledges that these constantly evolving beings would look a little different at this point in their history, and he treats them in a manner similar to Brian Hayles with the Ice Warriors, or Malcolm Hulke with the Silurians – as characters rather than just monsters. Several scenes are presented from Krillitane points of view. Equally enigmatic is the objective of Emily, a young woman who, like the Doctor, is not from around here, and who becomes another of the Time Lord’s temporary companions. Will Thorp, who played Toby Zed in The Impossible Planet / The Satan Pit, provides his fourth and final reading for this range, and you can see (or rather hear) why they kept asking him back. His is the most powerful reading in this collection, and he puts real emotion into it, conveying the terror and anger experienced by the characters. He also channels Sean Bean when voicing the gruff Captain Darke. Cooper’s narrative keeps you guessing and on your toes. In fact, if anything, it’s a little too full of ideas. With so many characters and so much going on, the medieval setting is often little more than window dressing. Indeed, certain aspects of the plot might have made more sense had the story been set on some Peladon-style primitive alien planet, with Emily and her quarry space-faring Earthlings, rather than very human-like aliens. Perhaps the historical setting was forced upon the author, in order to contrast with the other two books (all three were originally published at the same time). However, that’s my only real criticism of this storming success. The number of discs allocated to each novel varies: four for The Taking of Chelsea 426 and six each for Autonomy and The Krillitane Storm. However, this doesn’t mean that the opening story is massively shorter than the other two. In fact, The Taking takes 5 hours 3 minutes, Autonomy is the longest of the three at 6 hours 7 minutes, and The Krillitane Storm lasts for 5 hours 22 minutes. That makes a total running time of 16 and a half hours, which should keep you busy if you don’t already own these audio books. It’s not quite the 24-hour entertainment experience that is Hyperville, but it’s not far off!